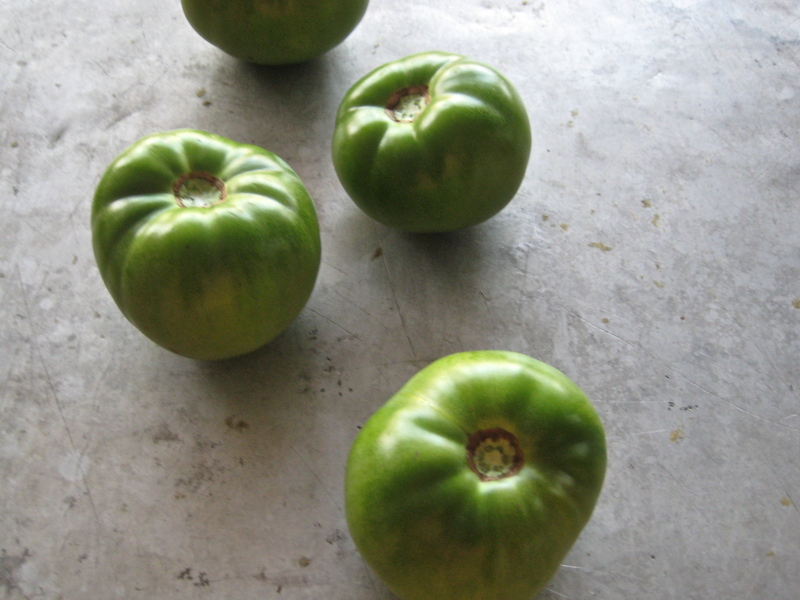 SEPTEMBER IS FOR FRIED GREEN TOMATOES | Jane Lear. Writing on Food and Travel. You may not think that green tomatoes have a season—they’re available all summer long if you have access to backyard beefsteaks—but they do, and it’s now. Farm stands are piled high with them, as growers know many of them will never completely ripen on the vine. The tomato is a tropical berry, after all, and requires lots of hot sunny days to reach its full potential—that deep, complex, almost meaty sweetness many of us live for each summer. September’s shorter days (thus fewer hours of sun) and cooler temperatures mean that a mature green tomato has a greater proportion of acid to sugar. Fried green tomatoes are great morning, noon, and night. They are delicious sprinkled with brown sugar while still hot in the skillet, just before you slide them onto warmed breakfast plates. If you somehow get roped into having people over for brunch (not my favorite meal), serve this and it will bring down the house. At lunch, a BLT made with a few slices of fried green tomato may seem like a lot of trouble to go to for a sandwich, but it is transcendent, and you are worth it. In the evening, you can always make fried green tomatoes a side dish, but they inevitably steal the show; that’s why I tend to build a meal around them, instead. Rely on leftover roast chicken or slices of baked ham to fill in the cracks, or make them the center of a vegetable-based meal, and I guarantee that no one sitting at your table will miss the meat. They’re wonderful with anything—snap beans or butter beans, corn on the cob or succotash, roasted eggplant or ratatouille, grilled zucchini with pesto or sautéed with shavings of Parmigiano-Reggiano, and potatoes, rice, or grits any which way. Add a platter of fresh sliced tomatoes to the mix, for a fabulous contrast in texture and flavor. Pickled black-eyed peas—what’s known as Texas caviar—always fit in nicely as well. And if you are fortunate enough to have a jar of watermelon rind pickles in the pantry, my Aunt Roxy would urge you to jump up and go get it. She knew that tomato and watermelon have an odd yet very real affinity for one another way back when, and she would greet the deservedly popular fresh tomato-watermelon salads of today with a satisfied little nod of recognition. I have to part ways with her, however, over cream gravy. That standard southern accompaniment for fried tomatoes is not part of my culinary repertoire where tomatoes are concerned. I have nothing against lily-gilding in general, but I’ve never liked something wet on top of something golden and crisp, no matter how much I enjoy the components individually. A butter sauce over pan-fried soft-shelled crabs. Ketchup or, yeesh, chili on french fries. A scoop of vanilla on a flaky double-crusted fruit pie. You name it, the end result is soggy food. I don’t see the point. As far as the actual coating goes, I’ve experimented with using seasoned flour or panko, but I keep coming home to cornmeal. It can be ground fine or coarse; it doesn’t matter as long as it’s sweet-smelling, a sign of freshness. And if you happen to have some okra in the fridge, why stop the frying at tomatoes? Trim the pods, cut them into bite-size nuggets and coat them like the tomato slices. Although it’s important not to crowd the pan while frying anything, there is always room to work a few pieces of okra into each batch. Whoever you are feeding will think you have hung the moon. 1. Preheat the oven to 325° or so to keep the tomatoes warm as fried. Have ready the beaten egg in one shallow bowl and the cornmeal—seasoned with salt, pepper, and a trace of cayenne, if desired—in another. Cut off the rounded ends of the tomatoes and cut the rest into slices about ¼ inch thick*. 2. Pour enough oil or drippings into a heavy skillet (cast iron is best, but not necessary) to measure about an eighth of an inch or so. Heat it over moderate heat until it shimmers. Meanwhile, working with one tomato slice at a time, dip it in the egg, turning to coat, dredge it well in the cornmeal, and put it on a sheet of wax paper**. By the time you coat enough slices to fit in the skillet (remember, don’t overcrowd), the fat in the pan should be good and hot. 3. Carefully, so as not to dislodge the coating, slip a batch of tomato slices into the hot fat and fry, turning as necessary, until golden on both sides. Drain the slices on paper towels or brown paper, transfer them to a wire rack set in a rimmed baking pan, and tuck them in the oven to stay warm and crisp. 4. In additional batches, coat and fry the rest of the tomato slices, adding more fat as needed. Be patient—give the fat time to really hotten up in between. You’ll be forgiven if you eat the first fried slice or two while alone and in the kitchen, but be sweet and share the rest. * If the slices are too thin, you won’t get the custardy interior you want in fried tomatoes. And if they are too thick, then the crust will burn before the interior is cooked through and soft. ** Letting the coated tomato slices rest for a minute or two on wax paper is something I remember watching Aunt Roxy do. It must give the cornmeal a chance to absorb some moisture and make up its mind to adhere. Posted: September 21st, 2011 under cooking, early autumn, recipes. Fried green tomatoes were always a treat for me growing up. I can still taste the salty, crispy coating. Usually it was just flour, salt and pepper.